Today we will teleport ourselves to a terrace close to your favourite beach. 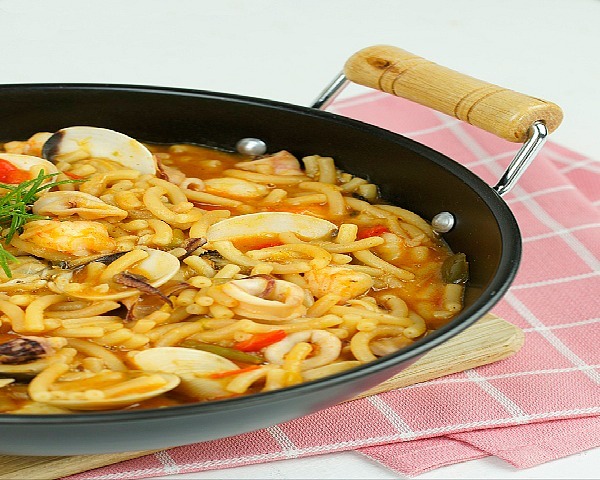 Is there any dish with more of the flavour and aroma of a holiday beside the sea than a seafood fideuá? A very Mediterranean recipe, but with a touch of the Rías Gallegas provided by our mussels. We invite you to close your eyes and get carried away by Mi Dulce Tentación that Silvia proposes for us. Leave the clams in cold water with salt for two hours so that they get rid of any sand they may have. Clean the baby squid, chop them into slices and set them aside. Peel the prawns and boil the shells in a litre of water for 15 minutes. Set the broth aside. In a frying pan with a dash of oil, lightly fry the chopped prawns for one minute. Remove and set aside. Do the same with the squid rings. In the same oil, sauté the onion, the peppers and the leak, all diced. Once the vegetables are sautéed, add the tomato concentrate and mix it all. Remove the frying pan from the heat and add the paprika. Mix everything well. Put the saucepan back on the heat and add the fideuá. Sauté for a minute and add the broth from the prawns. Cook the pasta for the time indicated by the manufacturer. When two minutes remain for it to be cooked, add the clams and cover the saucepan so that they open. During the last minute add the mussels, along with the sautéed prawns and squid. Mix all the ingredients well and leave to settle for a couple of minutes.